November 25, 2011 / David Marriott, Jr.
Be it our Periodic Table of Jazz, or the design called Visualizing Kind of Blue, or one of the three tribute to jazz greats in our Keep Calm and Dig Some Jazz series, there's sure to be a gift for the jazz fan in your life. Take advantage of these great savings until 10am Pacific Time -- use the code ZBLACKFRIDAY in our store to save now! These deals only last 10 hours total, so get out there and save some of that hard-earned money while you still can! June 10, 2010 / David Marriott, Jr. It's been a hugely exciting 24 hours since releasing The Periodic Table of Jazz to the world at large. I spent every free moment of the day on the phone, returning calls about the image, the idea, the design, and jazz in general. I received some great emails with questions - I will be getting to all of you, so please be patient. I also discovered more than a few more duplicate element symbols -- I think the color differences must be the explanation, otherwise how could so many people miss them, including me? I also took the opportunity to update the image in a few other ways, including taking a few missed opportunities with clever element symbols. One student requested shirts, and my motto has always been, "ask and you shall receive," so here are some Periodic Table of Jazz shirts - available in many styles, so take your pick. I've also posted a bit larger version for folks to look at -- sorry, I'm trying not to let a printable version out into the wild for free quite yet, but I'm working on that as well (a free version). Last but not least, if you ordered a poster and it has the old design, feel free to send it back to Imagekind or Zazzle and re-order the updated version. Otherwise, you have a one-of-ten (or less) rare version print! Treasure it! Enjoy - more as it comes! 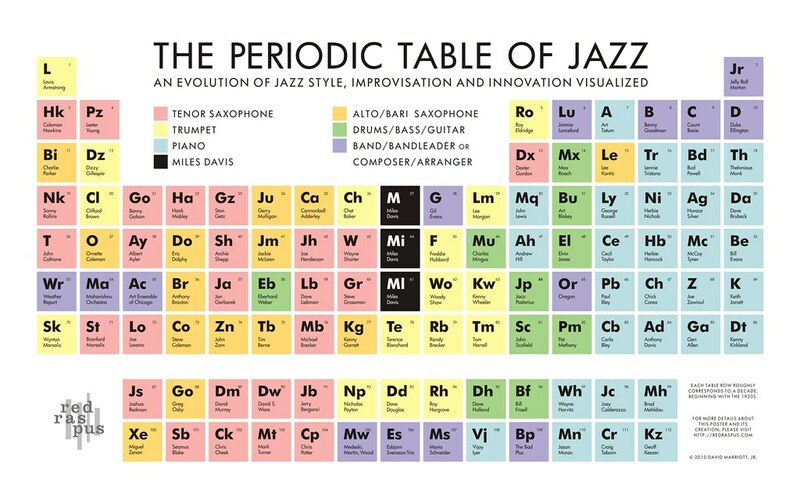 June 08, 2010 / David Marriott, Jr.
At long last, and just in time for graduation season, comes The Periodic Table of Jazz, a beautiful poster depicting "an evolution of jazz style, improvisation and innovation" in a visualization homage to the periodic table of elements. 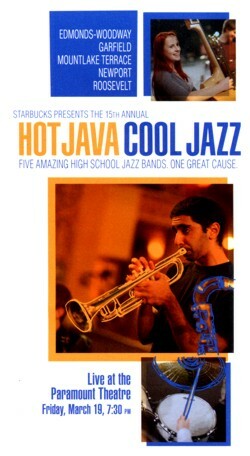 Perfect for band directors, music grads, and jazz geeks and fans alike! For full details on how to purchase, plus a lengthy article about the poster's creation, visit The Periodic Table of Jazz page. Stay tuned for more "jazz meets graphic design" from Red Raspus Music - there's more to come... If you are already sold and want to skip the long read and order one now, go to our Zazzle or Imagekind pages and get yours ASAP! 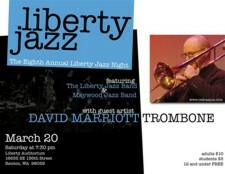 March 22, 2010 / David Marriott, Jr. I had the pleasure this past week of spending a few days with the Liberty High School Jazz Band, under the direction of Phil Donley. At his kind invitation, I spent some time with them Monday working with the band, performed some lunchtime concerts at the school on Friday with a short Q-and-A for the band members, and performed with them as guest artist at the Eighth Annual Liberty Jazz Night. Phil has done a great job getting his students to deal with some complex arrangements in a musical way, not just technical. Their rhythm sections are solid, the band features a few fine soloists, and they seem to dive in head first to whatever music Phil throws their way. They peaked at the performance Saturday night, so what more could you ask for! March 21, 2010 / David Marriott, Jr. When Mountlake Terrace High School band director Darin Faul approached me earlier this year to arrange Norah Jones' "Back to Manhattan" for the MTHS Jazz Band, I was excited, flattered, and most of all thankful -- I needed the work, too! There wasn't much to it, mainly just adding a backdrop to the original version, staying out of the way of the vocalist. But the last two things I've arranged for him -- Duke Ellington's "The Single Petal of a Rose" and Artie Shaw's "Concerto for Clarinet" -- were somewhat more daunting tasks. Ellington himself only recorded the piece as a solo piano composition, and the Artie Shaw piece had originally been recorded for a full orchestra -- and then there were the reputations of the pieces and the artists themselves. With a quick turnaround time needed for their Hot Java Cool Jazz performance, I had to squeeze all my musical and physical juices to get something completed that I was happy with. February 04, 2010 / David Marriott, Jr. The Partial Observer Presents "How To Alienate Your Audience in 10 Easy Steps"
December 02, 2008 / David Marriott, Jr. In a recent series of articles for The Partial Observer, Neo Classical columnist Holly Mulcahy writes about the ten most common ways that performers alienate their audiences. While the article is generally written from the context of a classical musician's point of view, nearly every word in this article applies to the vast majority of musicians as a whole. The article is written with humor to demonstrate it's points without coming across heavy-handed. 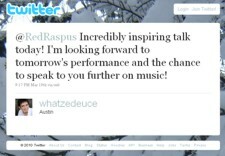 Musicians: pay attention to this article -- it could help you get hired back! May 26, 2008 / David Marriott, Jr.
Marc Fendel sent me a great list to put on the blog a while back, and I'm just now getting to posting it. The list is the twenty-one recordings that Marc learned from as a young student of jazz music in his first eight years of playing. You'd be hard pressed to find another list that provides such a solid foundation for becoming a jazz improvisor. Gerry Mulligan "with Chet Baker"
November 19, 2005 / David Marriott, Jr. Equal fear on both sides of the classical-vs-jazz fence: in his experience, he is just as intimidated by what classical vibraphone and marimba players can do as those players are of what he can do as an improvisor. Jazz harmony and theory can help inform a classical player: intuitively, a jazz player would look at a Bach Cello Suite and immediately go about understanding the harmonic development and chord movement. Joe Locke does the Monkees: Joe talked about his first drum lessons with the nuns at his Catholic school, and jamming away with the Monkees and their hit, I'm a Believer. Pre-teens and Whiskey: Joe talked about the fact that the rock band he played in during his early-teen years (12-15) was named after an Irish Whiskey, Tullamore Dew. Music-making = Responsibility: "Music-making is a big responsibility becasue you take the hearts of the audience in your hands -- you affect how those people will feel at any given moment." On getting in the zone: there is no way to plan this feeling -- you could be treating yourself right for weeks and practicing everyday, and you still may or may not achieve that state. Likewise, you could have not played a gig in months and still find this place. Joe Locke: "Yeah, I know." George Braith: "Ok, see you tomorrow..."
Matisse and Picasso: both spent much of their early development on the fundamentals of their art -- jazz musicians need to do the same to be creative and able to move the music (art) forward. Technique: will always be a means to an end -- Joe prefers to think abstractly, like, "I want to sound like water," and the technique comes from that aesthetic. A possible goal: to be one with the instrument, where what is coming out is not really you; you are merely the vessel through which the music comes; it is for you to nurture and take care of, but it is not yours. Practicing: a never-ending necessity is order to keep the bar high. Joe Locke continues to be an inspiration to me, and a model in the jazz world for anyone interested in getting to the next level. Joe - thanks for the clinic! August 05, 2005 / David Marriott, Jr. Since the end of July, I've been teaching out on Whidbey Island at Langley Middle School, thanks to music educator Chris Harshman. 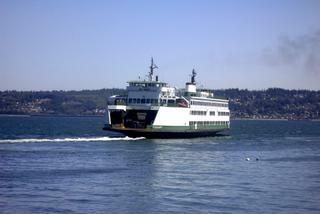 Every other Friday, Steve Korn, Mark Taylor and I head up on the ferry to teach private lessons on our respective instruments. In the fall, we will be moving to the high school and injecting older students to the mix. SO -- if you know any junior high or high school students on Whidbey Island interested in jazz-based instrument lessons, be sure to let them know there is now a high-caliber option available for them.